Sensei Simon will be visiting the UK in June and will train with us at that time. On Saturday 28th June about five karateka will be visiting the Burton St Dojo from Perth in Scotland, Sensei Simon will take the session, it will last for about three hours and its probably going to start at 10:00 AM this will be confirmed. Sensei Simon Golland Has now moved to Australia and has handed his club over to good friend and Martial Arts Instructor Sensei Graeme Sampson. Sensei Chinen is coming to France and we are welcome to train with the Jundokan at their International Gasshuku. Fri 27th April to Sunday 29th April. 9am - 5pm. Course costs 60€ per person for the three days. See Simon or Jo for more details if interested. Discussions are underway for a French gasshuku in the second half of 2012. Please register interest with either Sensei Simon or Sensei Gavin Hall. Exact dates and details still to be confirmed. 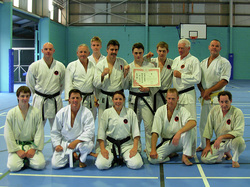 Sensei Ravey was presented with his 8th Dan during 'The Elements' seminar in Huddersfield - England. Supported by selected peers and associations, certificates and letters were complied in a portfolio for the presentation. International Society of Okinawa/Japanese Karate-do signed by Vince Morris and co-signed by Harry Cook. Koryu Kenkai Australia signed by Liam Keeley who trained with Sensei Ravey in Sensei Higaonna's Yoyogi dojo. International Ryukyu Karate Research Society signed by Patick McCarthy (who translated the Bubishi). The British Karate Association signed by Brian Seabright. ninja courses Sensei refers to in his book. Lastly, but placed first in the portfolio, we presented Sensei with a T.O.G.K.A. 8th Dan certificate in conjunction with with the above associations. Congratualtions Sensei, and thank you for your efforts. and best wishes for fantastic year ahead! Gavin and Isa have created an association for the practice of karate in Senegal and need our help. They are doing everything possible to help develop the sport in the village of their region where support from the authorities is totally absent. Many children who would attend classes can't, as their parents can not afford to enroll them. For a child under 14 years the training costs and clothing comes to approximately £25 or $41. This covers the cost of a gi, insurance and dojo for a student, for a year. training is an unaffordable luxury. to the address below. All donations will be cashed in January. Welcome Renshi Armando and students in Puerto Rico! Renshi Armando has joined the T.O.G.K.A and is our official Puerto Rico Chief Instructor. Sensei Simon was guest instructor at Sensei Brad's Delaneys Creek dojo last night. He was truly impressed with Will's training and effort. A quick learner, good listener and gives 100%. Delaneys Creek is a strong dojo and a pleasure to visit. Congratluations Nick Gault of Caboolture Dojo, Australia! showing true strength of character and dedication. Well done! Welcome Sensei Jorge Chappuzeau of Chile! Sensei Chappuzeau has joined the T.O.G.K.A and is our official Chile Chief Instructor. We will be adding some information and photos shortly. Another member to the family! Sensei SImon will be in Australia from October 4-24. ...the register tells no lies! Sensei Gavin Hall is now officially T.O.G.K.A Senegal Chief Instructor. Sensei Hall has a long history with the T.O.G.K.A and Goju Ryu training in England and Europe. Click here to view a short biography and photos. More pics coming soon! English Open and WOMAA World Games Qualifier. the Team GBR Robin Hood Open Tournament in Mansfield. Great to mix it with other styles - and a really positive environment. Cheers guys. 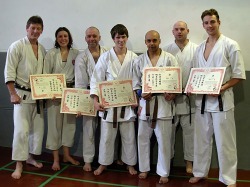 Sensei Graham Ravey, Jo Golland, John Lynock, James Turner, Jermaine Gordon, Sensei Simon Golland, Alex Jenkinson. Congratulations Johnboy, Alex, Jo, Turner and Jay! We have 3 new shodans in the club after yesterdays gradng, a new 2nd dan, and a new 3rd dan. 2 hour grading + 16 man fights. Thank you to everyone who turned up to participate in the fights. Sensei Ravey was very impressed as was Sensei Simon. Another good grading. 2.5 hour Shodan grading + 8 man fight. and passed a really tough grading. 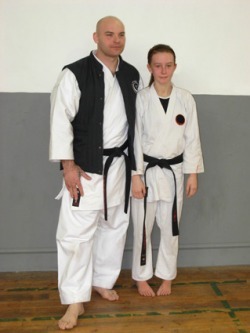 Everyone is really impressed and proud to have you as a Shodan in the club! "I've seen many a senior student who wouldn't have passed what you took on today. Times like this make me proud to be a Sensei." Kady is going for her Junior Shodan. and structure which will be put into force. Johnboy will be grading for Sandan. Alex will be grading Nidan. Joanne, Turner and Jay will be going for Shodan. Last training session for this year is Tuesday December 22. Training will resume Tuesday January 5, 2010! Sensei Ravey will be in Australia for a month from Feb 17, 2010. March 06 Saturday, 2-4pm: Training all grades. March 07 Sunday, 10-12am, Lunch 1-2pm: Open session our club and other styles. March 08 Monday, 6.15-8.15pm: Training all grades. March 10 Wednesday, 6.15-9.00pm: Black Belt Grading. Training back to normal this week - 13th Oct onwards. Senior Grades: Monthly Sunday Session SEPT 27. 10am at Sheffield dojo. Senior TOGKA members only. It was a great honour for me to sit on the panel of the TOGKA grading held at Mastin Moor this Wednesday. 2 grading candidates exceeded my expectations and were given their grades. Adam - Shodan, Joanne - 1st Kyu. AGAIN, a grading unlike any I have seen before... as mine was a blur! Senior Grades: Next Monthly Sunday Session with chief instructors is on AUG 30. Senior T.O.G.K.A and invited guests only. Please speak to Sensei Simon for more details. SUNDAY JULY 5 - Sensei Ravey will be instructing at an IBA Seminar in Worksop. £10 entry and participation. Please ask for further info. they are very much appreciated by all. CONGRATULATIONS TO DAVE AND HIS WIFE WHO NOW HAVE A BEAUTIFUL BABY GIRL "ELLA". but last night i was proud to be your Sensei and grade by your side. Club merchandise is now available: Hoodies, t-shirts and accessories. Images coming soon. We also design and produce other club merchandise. Please contact for further details.